I needed this salad this weekend. Despite the groundhog’s well-intentioned prediction, spring has yet to arrive in central North Carolina. The weather is cold, rainy and a bit depressing. I wanted salad, but it was too cold out for a traditional cold lettuce salad. So I was happy that I found fresh picked Brussels sprouts at the farmer’s market. They were the focus of a warm, roasted sprout salad that helped to elevate dinner from chilly to cozy. This was a big experiment, but it paid off–a (reasonably) healthy, warm salad that was satisfying and filling. I’ve made one adjustment here–I would definitely add a squeeze of lemon to lighten up the caramelized onions and bacon. We used only the zest, but I think the lemon juice would add a lot. While sprouts Re roasting, cook the bacon until crisp. Crumble bacon and set aside on paper towel to drain, reserving 2 tbsp of bacon fat in the pan. When sprouts are roasted and browned on the edges, remove from oven. 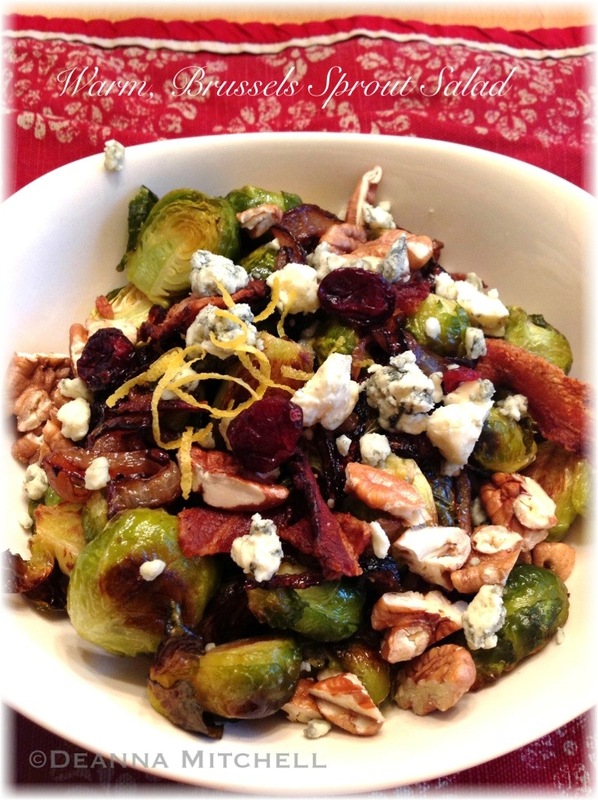 In a large bowl, gently toss sprouts, onions, blue cheese, cranberries, crumbled bacon and pecans. I can’t even begin to tell you how amazing this looks. I am soooo making this! Is this your creation, Deanna? Cause this is seriously amazing!! Ok, so I did a search for Brussels sprout salad and a lot of people have similar ideas 😦 Well, apparently, I am not a genius. Still tastes good though! I see Posana in my future 🙂 Yum! Quinoa would be great in that salad–I used barley because I had some left from making your totes amazing beef and barley stew! I needed another way to cook brussel sprouts and this looks so good! I usually just cook them in balsamic vinegar but this is so unique! Thanks for the idea! Yum! Have to try this with quinoa!!! Thanks for the link!